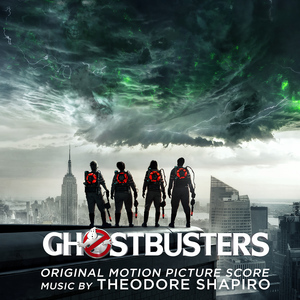 Sony Classical proudly announces the release of Ghostbusters (Original Motion Picture Score) to accompany Sony Pictures' highly anticipated feature film Ghostbusters, in theaters July 15. Featuring a score by multi-award winning composer Theodore Shapiro, the album is available now digitally and on CD July 15. Theodore Shapiro saw Raiders of the Lost Ark in 1981 as a nine-year old boy, and afterwards was certain of two things: one - he wanted to be an archaeologist, and two - he couldn't stop thinking about the music. His plans to be an archaeologist eventually faded, but his interest in film composition did not. He went on to study music, write a musical about a cryogenically frozen head, and play in a neo-disco band called God at Brown University, and then received a Master's degree in composition from The Juilliard School. Following Juilliard he began both scoring films and writing commissions for the concert hall, including works performed by the Los Angeles Philharmonic, Seattle Symphony, New York Chamber Symphony, and St. Paul Chamber Orchestra. After scoring some notable independent films in New York, including Karyn Kusama's Girlfight, and David Mamet's Heist and State and Main, Shapiro was hired to score the hit comedy Old School for director Todd Phillips. He has since become one of Hollywood's most sought after composers. His recent film work includes Spy, directed by Paul Feig and starring Melissa McCarthy; Trumbo, directed by Jay Roach and starring Bryan Cranston and Helen Mirren; The Intern, directed by Nancy Meyers and starring Robert DeNiro and Anne Hathaway; The Secret Life Of Walter Mitty (for which he won an International Film Music Critics Award); Ted Melfi's directorial debut, St Vincent, starring Bill Murray; and Infinitely Polar Bear, starring Mark Ruffalo and Zoe Saldana. He was nominated for an Emmy for his score to the HBO film, Game Change. Other notable work includes the Ben Stiller-directed action-comedy Tropic Thunder; Marley and Me, directed by David Frankel and based on the best-selling novel; The Devil Wears Prada, starring Meryl Streep and Anne Hathaway; John Hamburg's bromance, I Love You, Man; and the Oscar-nominated animated film, The Pirates! Band of Misfits. Ghostbusters makes its long-awaited return, rebooted with a cast of hilarious new characters. Thirty years after the beloved original franchise took the world by storm, director Paul Feig brings his fresh take to the supernatural comedy, joined by some of the funniest actors working today - Melissa McCarthy, Kristen Wiig, Kate McKinnon, Leslie Jones, and Chris Hemsworth. This summer, they're here to save the world! Directed by Paul Feig, the film is produced by Ivan Reitman and Amy Pascal, and written by Katie Dippold & Paul Feig, based on the 1984 film "Ghostbusters," an Ivan Reitman film, written by Dan Aykroyd and Harold Ramis.